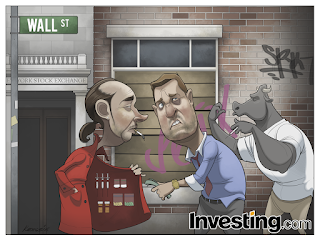 ILLUSTRATION: NOAH KROESE: Investing.com: The pusher man. This week's comic actually happened a day earlier than usual (Tuesday instead of Wednesday), owing to the turmoil in world markets last Friday and earlier this week. Investing.com wanted the comic to be as timely as possible, which is why they asked me to draw it early. Being a creature of habit, the schedule change threw me off a bit, but I did my best to rally and put up a good fight. It's been a rough ride for many in the financial world as of late, mainly because of the decline in the Chinese markets and the currency devaluation. In an effort to mitigate that decline, China decided to cut interest rates, which subsequently spurred the markets (somewhat). This week's comic has to do with that decision to cut interest rates. 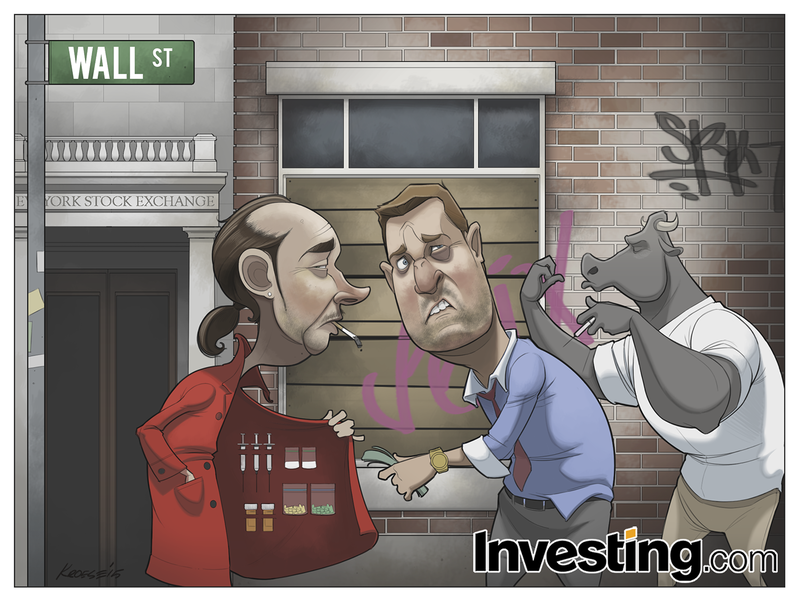 I was asked by the good folks at Investing.com to draw a Wall Street trader buying drugs from a drug dealer in a red trenchcoat. (The implication is that the markets are "addicted" to stimulus measures like lowering interest rates.) In the background, they asked me to put in a bull shooting up in the background. 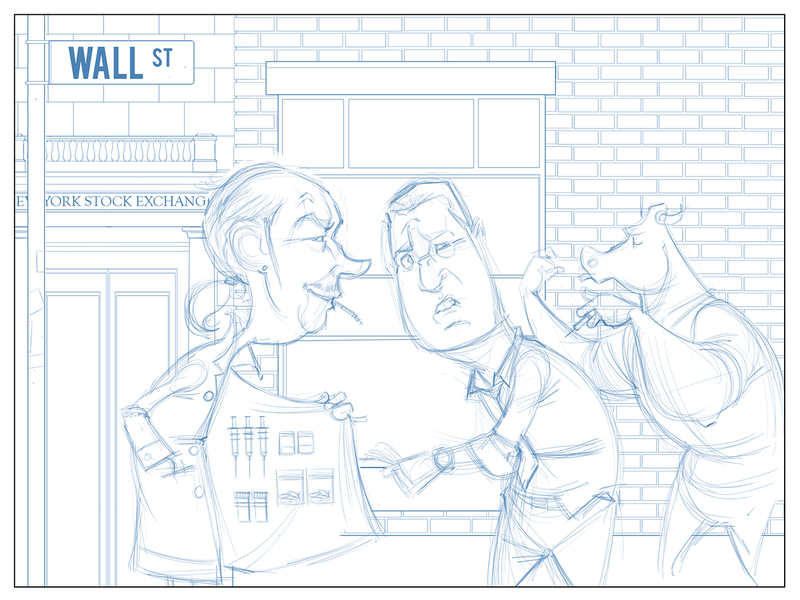 All this was to take place on a street corner with the New York Stock Exchange in the background. Tough comic this week. Three characters and a fairly complex background meant a lot of hours on this one. I can't say I'm super happy with everything, but I think it's a decent comic. The dealer's face still bugs me a bit. You can see I changed it from the original sketch. He looked a little too cartoonishly villainous with the smile. But something about his face still bothers me for a reason I can't put my finger on. To be honest, though, after this many hours, I can't really see the comic anymore. It's just a collection of lines at the moment and it will take a few days for the lines and color to re-assemble themselves into a composition I can assess with any clarity.